Is Deepika Padukone Sabyasachi's Best Muse Or What? Deepika Padukone loves Sabyasachi's creations; this we can tell from her stylist Shaleena Nathani's Instagram feed. No matter how much Raw Mango she might have worn recently, Deepika returns to Sabyasachi. Make no mistake, Sabyasachi loves her back just as much, if not more. If you need any proof of this love between the two, all you really have to do is look at Sabyasachi's latest venture, in which he has taken his artistry a step ahead and into a different zone to make a series of handcrafted wallpapers for Nilaya by Asian Paints. The designer shared pictures of his new project on Instagram and while the wallpaper is, like most of Sabyasachi's work, breathtakingly beautiful, what is really hard to miss is the fact that it is Deepika Padukone, front and centre, in all the posts that were meant to showcase the wallpaper. Even Sabyasachi's wallpaper cannot do without Deepika, leave alone his clothes. We would talk more about the wallpaper and it's beauty, but let's be honest, with Deepika Padukone right in front of it, wearing gorgeous clothes and jewelry from Sabyasachi's own collections, it's hard to look at the work put into creating the hand crafted wallpaper collection, stunning as it is. Deepika Padukone looks absolutely ethereal in her favorite designer's creations. With traditional jewellery and work on the garments and hair and makeup that went just right with it, Sabyasachi created a vision most are finding hard not to be in awe of. Even though the images laid a lot of emphasis on Deepika and the garments on her, Sabyasachi did explain about the inspiration behind his wallpaper collection and post a few videos of the actual making of the collection. If you follow Sabyasachi on Instagram, you know he often accompanies the photos of gorgeous clothing with poetic and personal anecdotes. With the wallpaper posts, he wrote: "If you grew up in Bengal at the time I was growing up, sometime between late seventies and early eighties, you would know that the consumer was the designer. I spent hours watching my mother and her friends stretching organdy sarees over hand frames and hand painting exotic blooms on them. More often than not, they would match the blooms in their sarees to the real blooms on their hair. Talk about style! This is my homage to them. My mother and all her Bengal art school friends. What they lacked in terms of resources, they always over compensated with imagination. That is the true art of dressing well and good housekeeping!" Is Deepika Padukone Sabyasachi's Best Muse Or What?SWIRLSTER STAFFLAST UPDATED FEBRUARY 05 2018, 07:27 PM Even Sabyasachi's wallpaper cannot do without Deepika, leave alone his clothes Deepika Padukone served as muse for Sabyasachi's latest wallpaper collection Deepika Padukone loves Sabyasachi's creations; this we can tell from her stylist Shaleena Nathani's Instagram feed. No matter how much Raw Mango she might have worn recently, Deepika returns to Sabyasachi. Make no mistake, Sabyasachi loves her back just as much, if not more. If you need any proof of this love between the two, all you really have to do is look at Sabyasachi's latest venture, in which he has taken his artistry a step ahead and into a different zone to make a series of handcrafted wallpapers for Nilaya by Asian Paints. The designer shared pictures of his new project on Instagram and while the wallpaper is, like most of Sabyasachi's work, breathtakingly beautiful, what is really hard to miss is the fact that it is Deepika Padukone, front and centre, in all the posts that were meant to showcase the wallpaper. Even Sabyasachi's wallpaper cannot do without Deepika, leave alone his clothes. We would talk more about the wallpaper and it's beauty, but let's be honest, with Deepika Padukone right in front of it, wearing gorgeous clothes and jewelry from Sabyasachi's own collections, it's hard to look at the work put into creating the hand crafted wallpaper collection, stunning as it is. Deepika Padukone looks absolutely ethereal in her favorite designer's creations. With traditional jewellery and work on the garments and hair and makeup that went just right with it, Sabyasachi created a vision most are finding hard not to be in awe of. Even though the images laid a lot of emphasis on Deepika and the garments on her, Sabyasachi did explain about the inspiration behind his wallpaper collection and post a few videos of the actual making of the collection. My mother and all her Bengal art school friends. What they lacked in terms of resources, they always over compensated with imagination. That is the true art of dressing well and good housekeeping!" 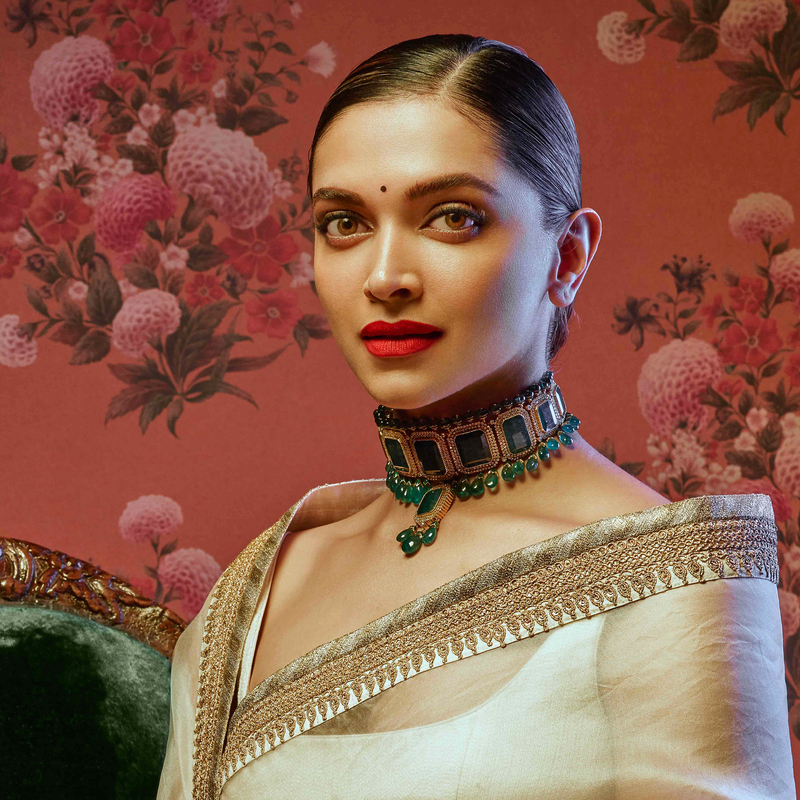 This isn't the only time Deepika Padukone has acted as the perfect muse for Sabyasachi. Even when Deepika isn't actually working with or on an assignment for Sabyasachi, she is often seen wearing clothes from his collections. Through the promotions of her latest film "Padmaavat," Deepika's stylist Shaleena made sure she included plenty of Sabyasachi designs. Here are some of our favourite ones. In a departure from Sabyasachi's quintessentially traditional garments, Deepika stepped out for an interview in a floral embroidered skirt from the designer's latest collection. Definitely not something we're used to seeing from Sabyasachi Mukherjee.